The gravitational field surrounding this massive cluster of galaxies, Abell 68, acts as a natural lens in space to brighten and magnify the light coming from very distant background galaxies. Like a funhouse mirror, lensing creates a fantasy landscape of arc-like images and mirror images of background galaxies. 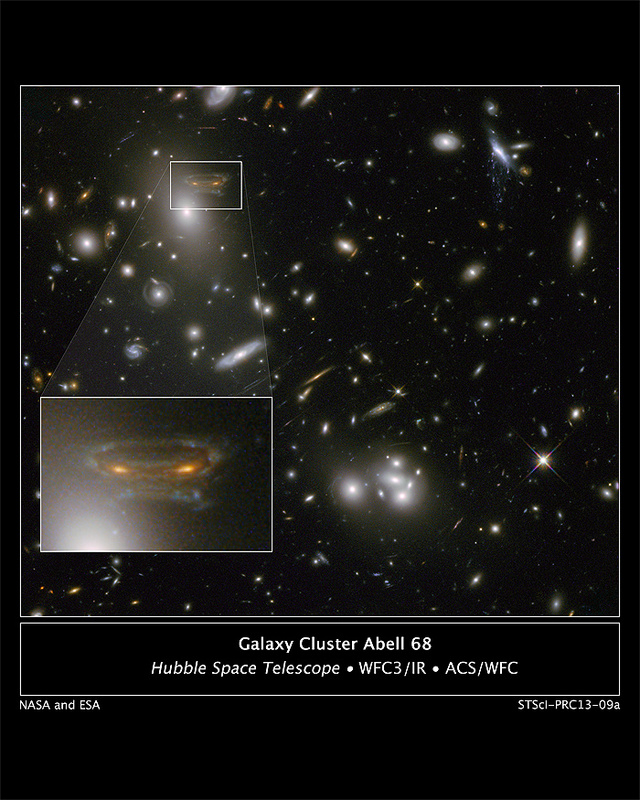 The foreground cluster is 2 billion light-years away, and the lensed images come from galaxies far behind it. In this photo, the image of a spiral galaxy at upper left has been stretched and mirrored into a shape similar to that of a simulated alien from the classic 1970s computer game Space Invaders! A second, less distorted image of the same galaxy appears to the left of the large, bright elliptical galaxy. In the upper right of the photo is another striking feature of the image that is unrelated to gravitational lensing. What appears to be purple liquid dripping from a galaxy is a phenomenon called ram-pressure stripping. The gas clouds within the galaxy are being stripped out and heated up as the galaxy passes through a region of denser intergalactic gas. This image was taken in infrared light by Hubble's Wide Field Camera 3, and combined with near-infrared observations from Hubble's Advanced Camera for Surveys. The image is based in part on data spotted by Nick Rose in the Hubble's Hidden Treasures image processing competition.